Great field position for the Patriots, starting at their own 47. Defense gets a big stop inside the 10 and the Patriots wind up starting their drive at the 46. Patriots defense allowed an average of 8.5 points per game in the 2nd half this year, fewest in in the AFC. Jacksonville (9.6) was 5th. The Jaguars are just so fast. The way these LBs are closing on Lewis is insane. #Patriots DE Trey Flowers hurt on that last play. #Jaguars will take a 17-10 lead into the fourth quarter. The Patriots ran 9 offensive plays that quarter. Count' em, 9. They've only run 36 offensive plays in the game through three quarters. This is a far cry from the 93 offensive plays they ran against Atlanta in Super Bowl LI or the 72 they ran against Seattle in Super Bowl XLIX. This is the 6th time during the Brady/Belichick era that the Patriots have had no more than 10 points through 3 quarters. They're 2-3 in those games (wins in the Tuck Rule Game and last year's SB, losses in Denver in 2005 and 2013 seasons and in SB XLII vs the Giants). Patriots officially list Gronk as Out. Rob Gronkowski officially ruled out with a head injury. Lambo 43 FG is .... good. Jaguars take a 20-10 lead with 14:52 left 4Q. Lambo kick from 43 is good. Jags lead 20-10. Bortles continues to make high percentage throws and force nothing. Worth repeating: Jags are 10-0 when he doesn't throw a pick. Ball was starting to come out. Not fully out. Tough call coming. Seems hard to call that incontrovertible but on the other hand I never know. Ruling stands. Fumble. Jaguars ball. 3rd-and-18. Brady to Amendola. Of course. Biggest play of Phillip Dorsett's year right there. Huge spot. Brady to Amendola on the 8-yard TD and the #Patriots have pulled within 20-17 with 8:44 left. After only running 9 plays in the third quarter, the Patriots score on an 8-play drive. They've run 11 plays already in the fourth quarter. 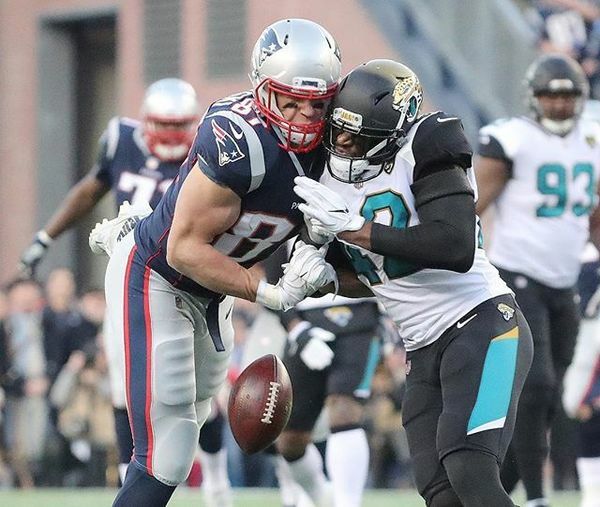 Jaguars 20, Patriots 17. 6:21 left 4Q. Patriots first and 10 at their own 19. Great game.